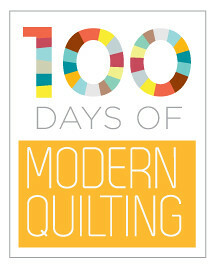 And like that, 100 Days of Modern Quilting is all over! That went quickly, didn’t it? 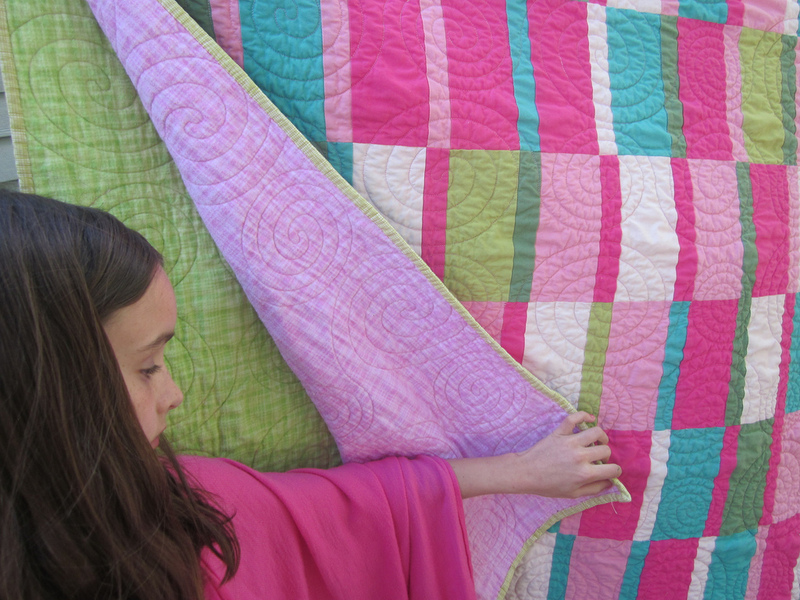 Since the beginning of the year we’ve shown you loads of modern quilts and lots of tutorials. We hope that you’ve enjoyed following along for the past 14 weeks. It’s been a thrill for us to be able to feature so many wonderful quilters and quilts and we hope that maybe you discovered something new or learned a little along the way. We thought a list of links of every post for the series would be something people would like to refer to. We hope that we’ve created a resource that you can turn to regularly for inspiration and ideas. The 100 Days button on the home page links to this post, so come back and visit all you’d like! 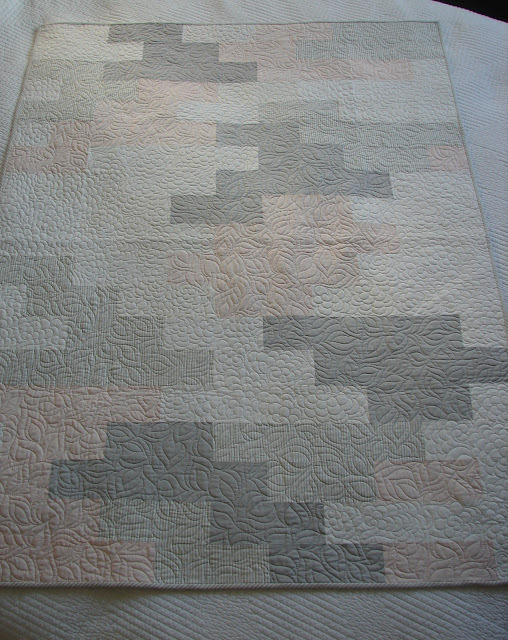 The photo above shows a queen bed quilt that I free-motion quilted on my home machine. Finishing a large quilt on your home machine is certainly more challenging than finishing a pillow or baby quilt, but it’s totally do-able! 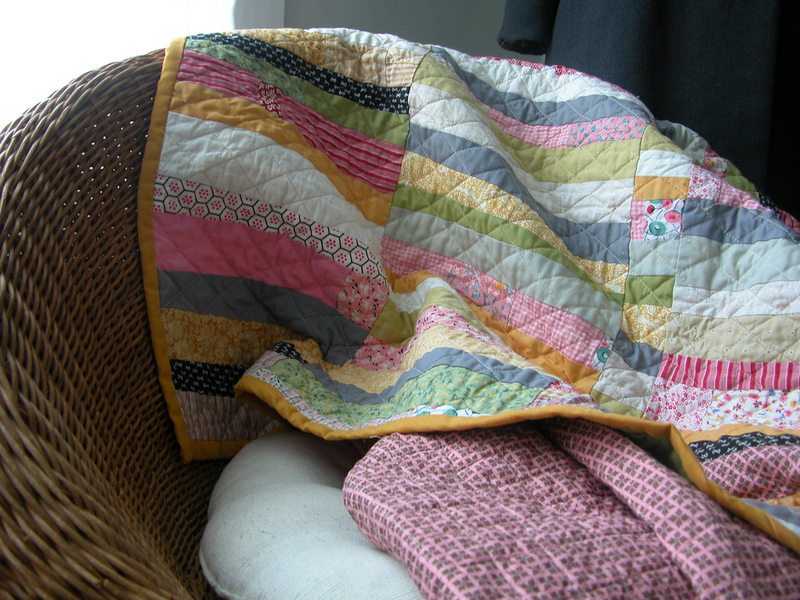 Continue reading this post for some tips on finishing a large quilt at home. Make a stable quilt sandwich. 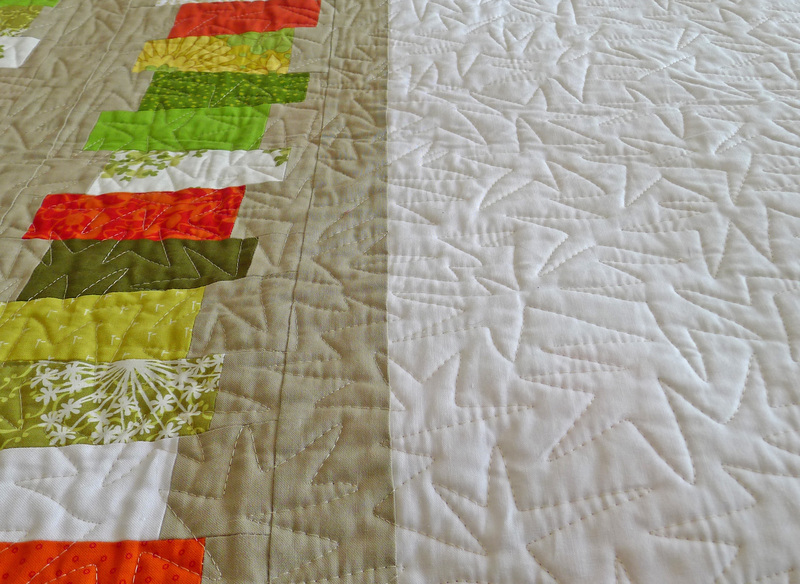 With bigger quilts, this step can be almost as challenging as the quilting itself! It’s important though, so do take the time to carefully layer your quilt top, batting, and backing. Make sure that you smooth out any wrinkles and remove any pesky lint or hair. If you’re pin basting, arrange your pins in a regular, gridded formation. (You’re going to have to stop and take them all out as you work and you don’t want to be surprised by their location!) For free-motion quilting, I like my basting pins to be about 5” – 6” apart. 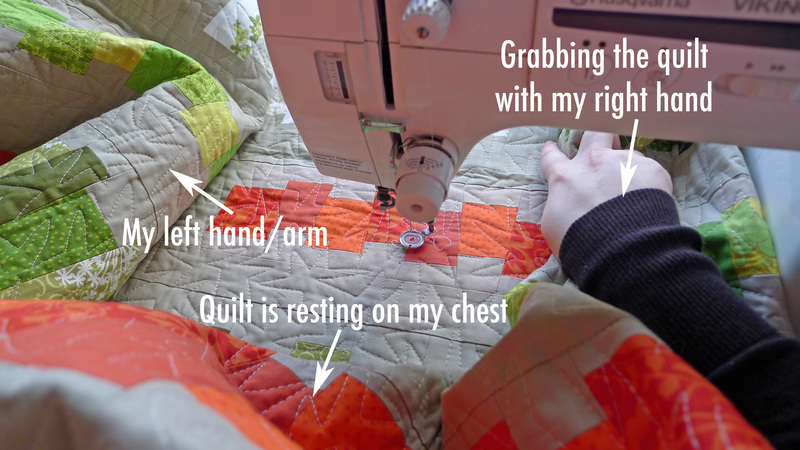 Moving a larger quilt around on your machine is likely to put some stress on the needle. 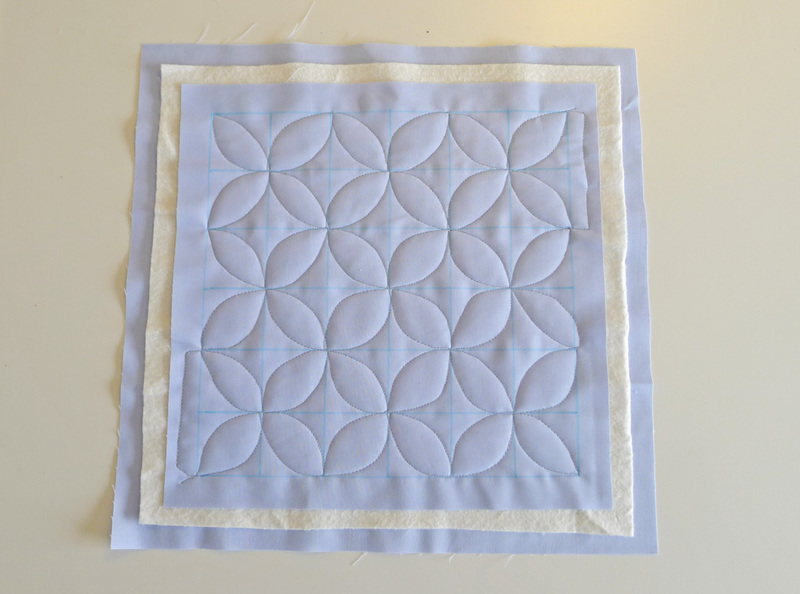 Counter this by using a 90/14 Machine Quilting needle, rather than a smaller needle that you might use for piecing. Make sure you have enough thread to complete your quilt. 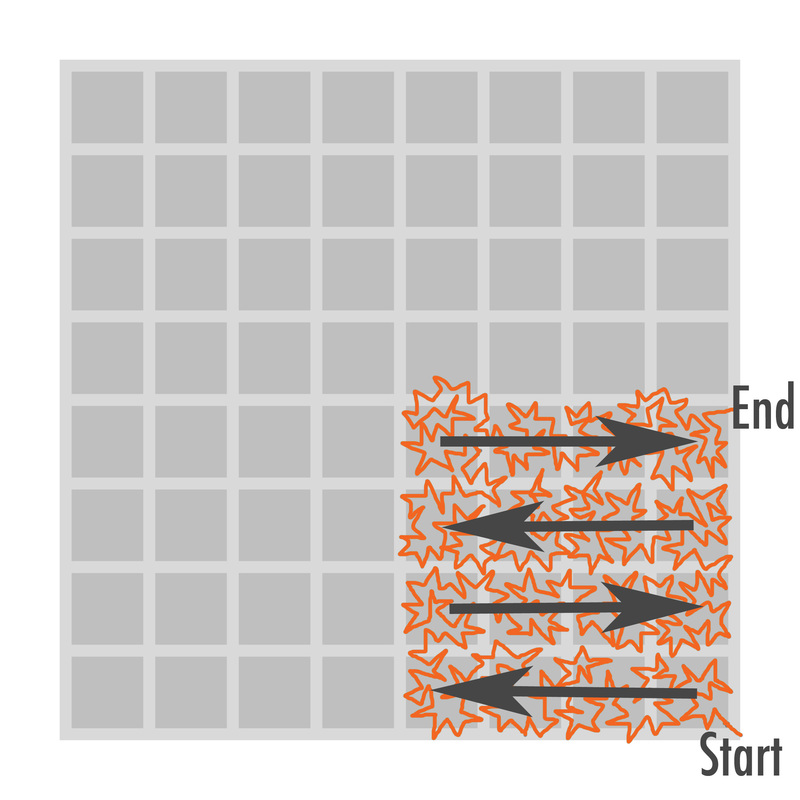 (How much you need will vary depending on your quilting pattern.) I also like to wind as many bobbins as I think I’ll need before I start quilting. If you’ve pin basted your quilt, make sure you have a container nearby to collect the pins. I usually put a wooden stool or smaller folding table to my right and slightly behind me and keep all of my supplies and any beverages there, so they won’t get knocked over by the quilt I’m working on. Create a plan of attack. It’s almost always going to be easier to quilt when the bulk of your project is on the left of or behind the machine, rather than on the right of the needle (under the machine arm) or in front of the machine. Because of this, I usually quilt large quilts in quadrants. Here you can see an imaginary quilt divided into 4 quadrants. If I were quilting this quilt, I would start with the lower-right quadrant and work my way around the quilt counter-clockwise. For Quadrant 1, I start in the lower-right corner and work my way back and forth across the quadrant, ending in the upper-right corner, and filling the entire space with quilting. During this process, the bulk of the quilt (Quadrants 2, 3, and 4) will remain to the left of my needle or behind the machine. Only parts of Quadrant 1 will be under the machine arm. Before starting to quilt Quadrant 2, I rotate the quilt 90° to the right (so Quadrant 1 is on the left of Quadrant 2). For Quadrant 2, I start quilting in what is now the lower-left corner of the quadrant – right next to where I stopped quilting Quadrant 1. 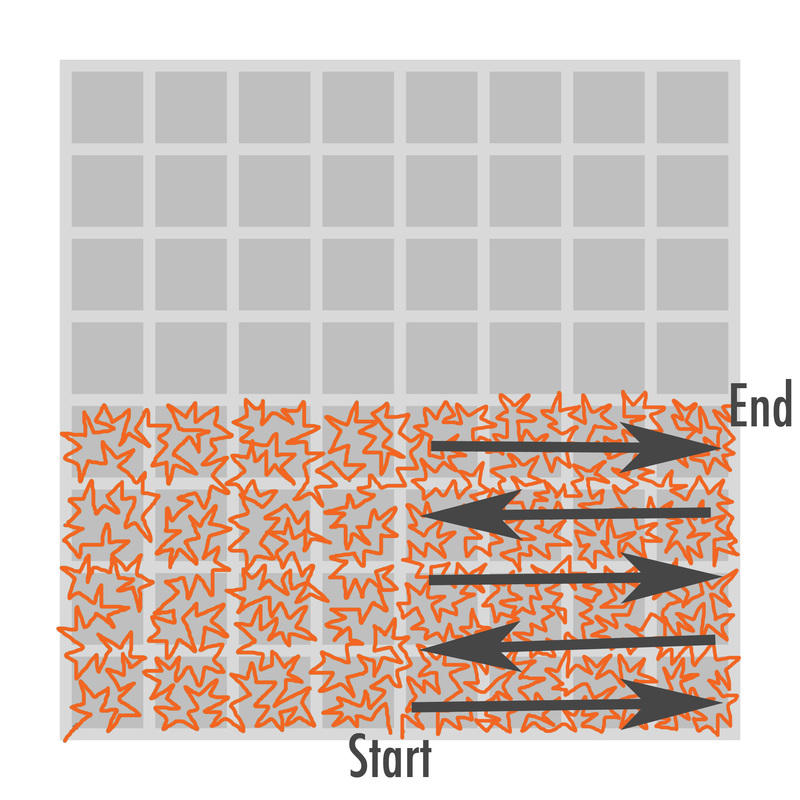 I then quilt back and forth across Quadrant 2, ending in the upper-right corner and filling the entire space. 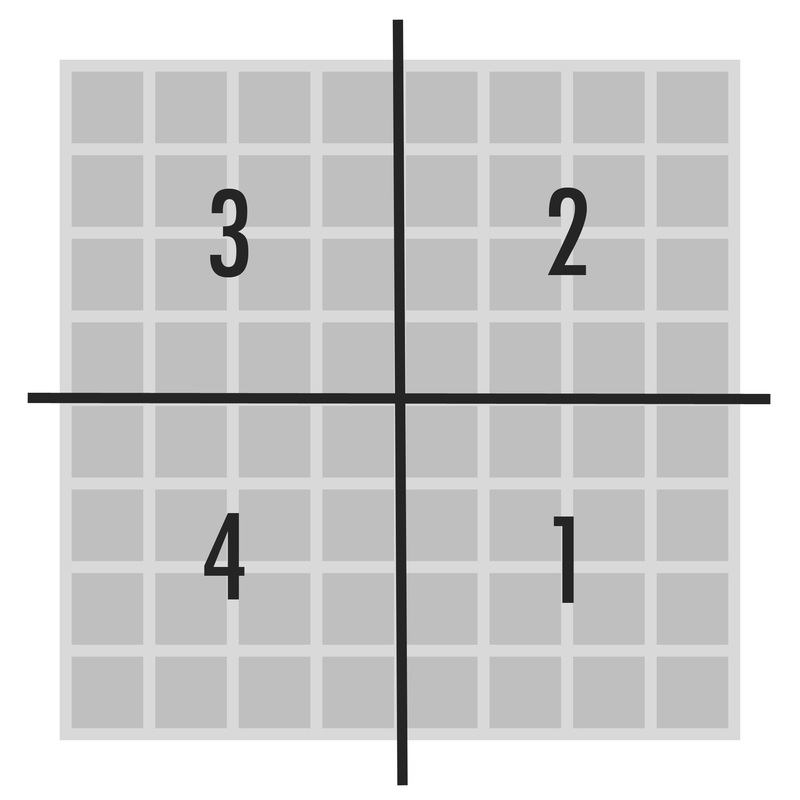 Once again, the 3 quadrants that I’m not working on remain to the left of or behind the machine. 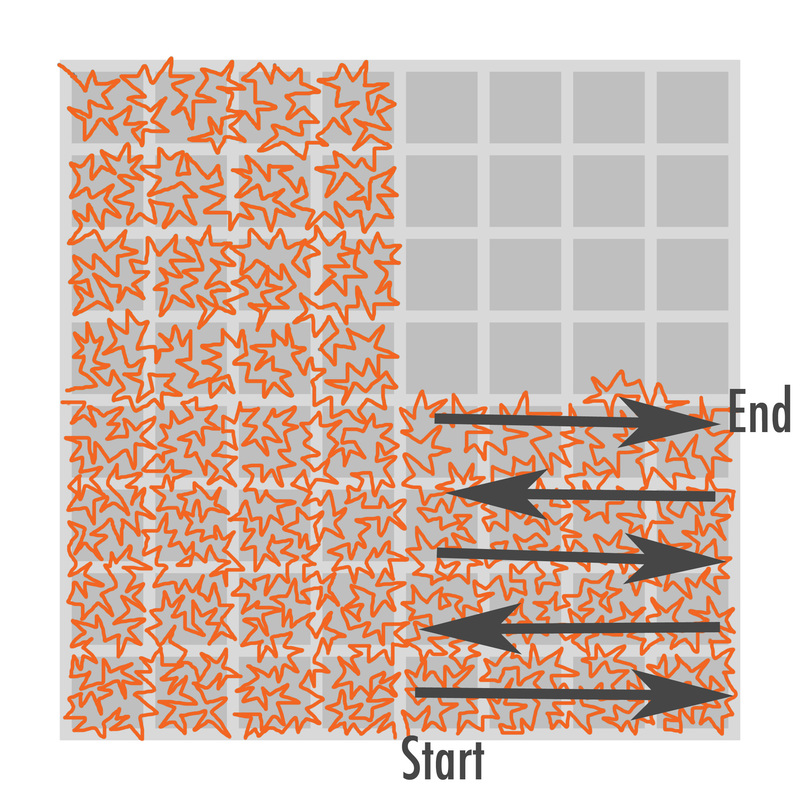 Now, I turn the quilt 90° to the right and repeat the same process to quilt Quadrant 3, starting in the lower-left corner and working to the upper-right corner of the quadrant. I’ll repeat the same process for Quadrant 4 but because, this time, I’m going to be quilting up to the already-quilted edge of Quadrant 1, I’ll pay special attention to the layers of my quilt sandwich, smoothing them as necessary to ensure that there’s no puckering. If I’ve made a good quilt sandwich, this shouldn’t be an issue, but I think it’s always a good idea to keep an eye on this part of the quilting, maybe taking it a little slower than the other parts. You may have noticed that my plan of attack has me starting at the bottom and then working my way up to the top of each quadrant. 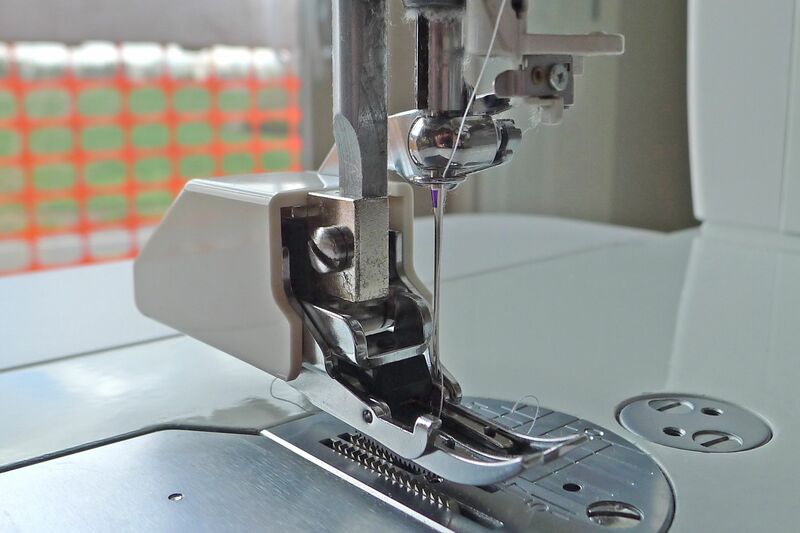 Because free-motion quilting doesn’t make use of the machine’s feed dogs, it’s not necessary to feed your quilt through the machine from front to back, as you would with normal sewing. In fact, I find that it’s much easier to start with the quilt behind my machine and pull it toward me as I work. This also makes it possible for me to see what I’ve just quilted, rather than continually pushing it away from me. Manage the weight of the quilt. Position your machine table against a wall or, ideally, in a corner with one wall to the left of the machine. 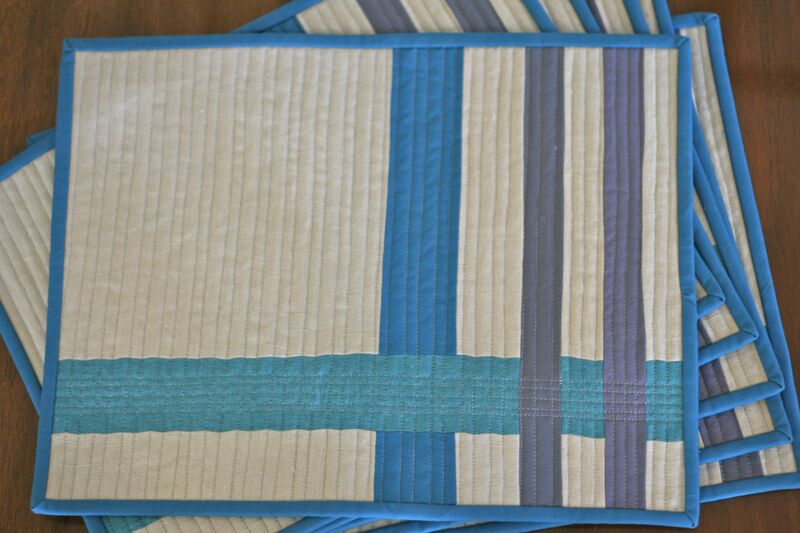 This will help to keep your quilt from falling off the back or side of the table. As you work, rest the quilt on your arms, chest, and shoulders, rather than letting it pile into your lap. This can be awkward at first, but having the quilt resting on your body will also make it easier to move the quilt. My hands are not right near the needle, but I’m holding the quilt so that the quilting area remains flat. 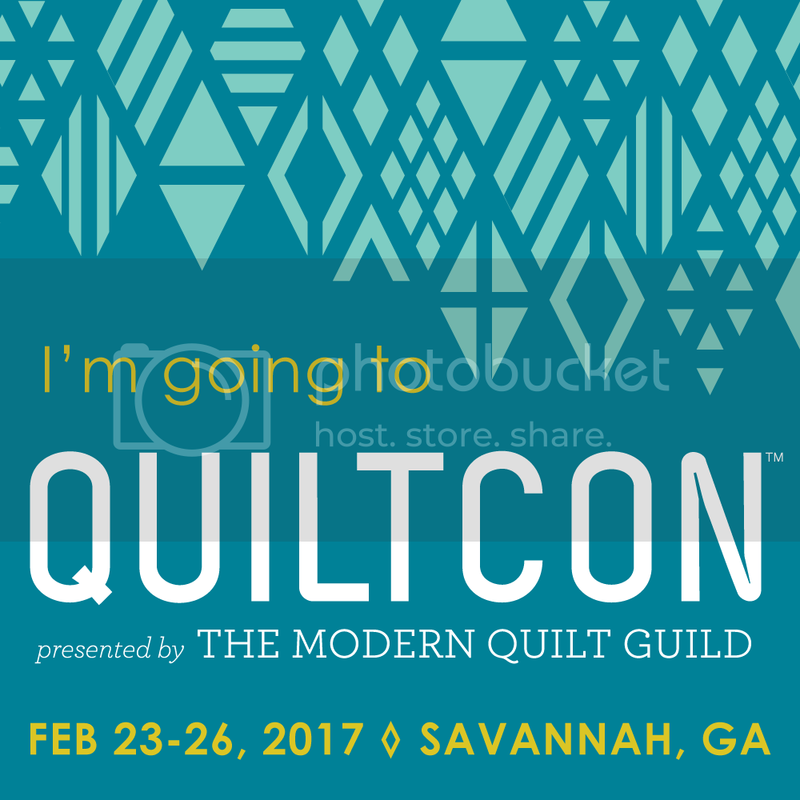 Because I have a firm grip on the quilt and am managing its weight so that nothing is hanging off the table or into my lap, I don’t need to have my fingers right up near the needle and can attack somewhat larger areas than I could if I were trying to push the quilt around with my just my fingertips. As with anything, you may find that other methods work better for you, but I hope this post gives you some ideas about how you can finish a larger quilt on your home machine! 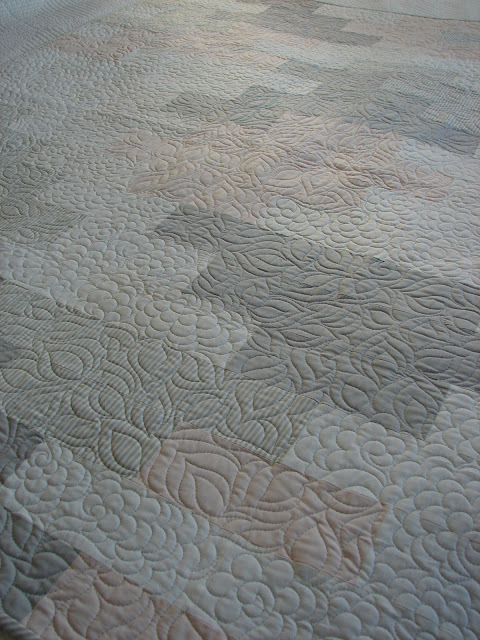 Today’s featured quilt was pieced by Jacquie Gering and long arm quilted by Angela Walters. 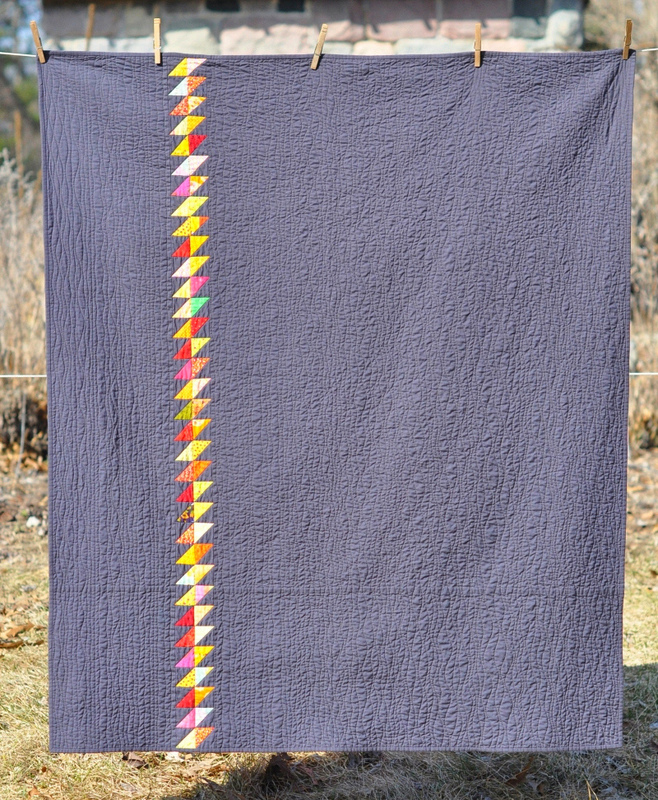 You can read about Jacquie’s inspiration for her Low Volume quilt on her blog, Tallgrass Prairie Studio. 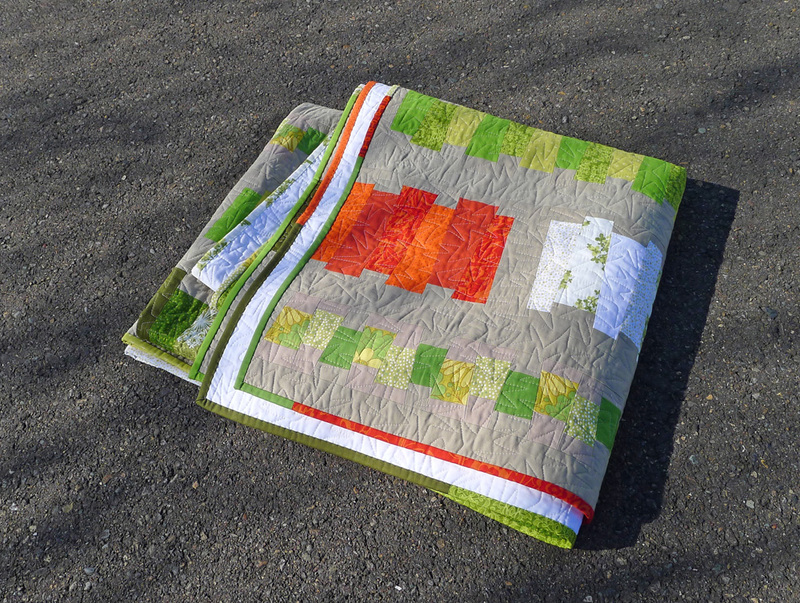 Continue reading here for Angela’s answers to some questions about this quilt and her process. 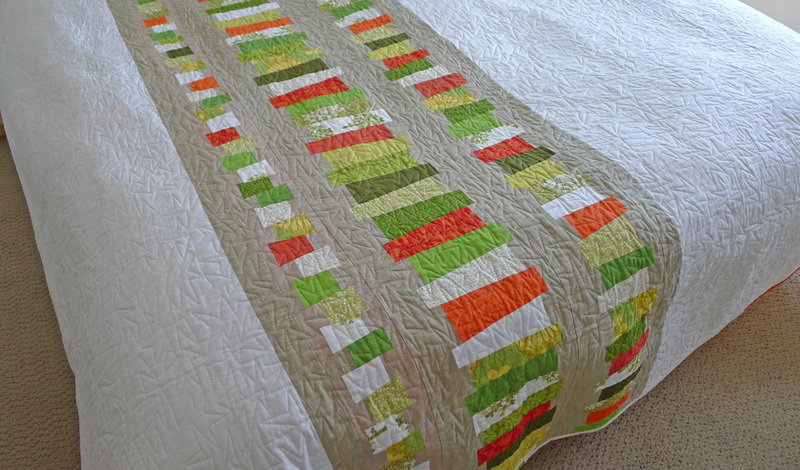 Can you tell us a little more about the process of quilting Jacquie’s Low Volume quilt? 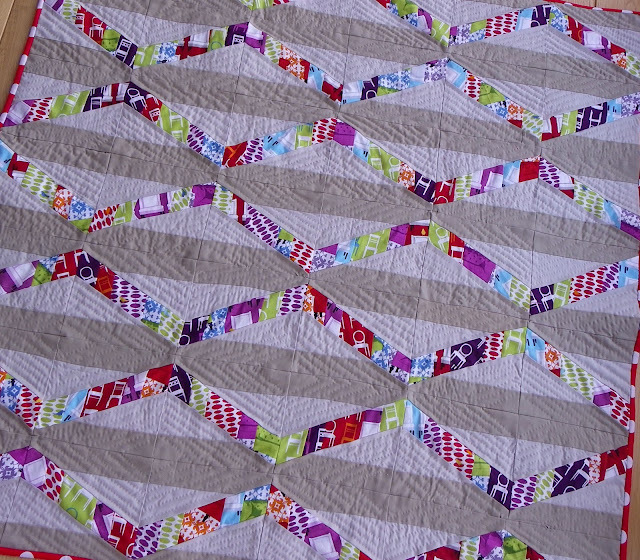 For instance, how did you determine the quilting design? 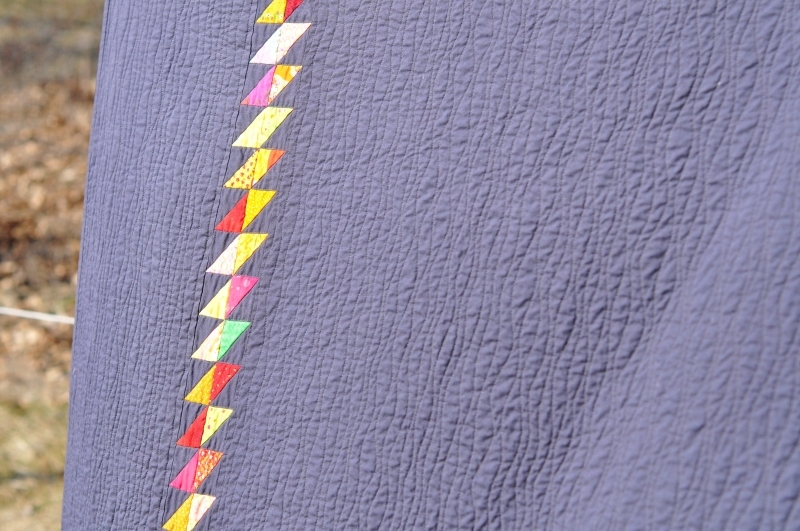 We see a lot of quilters puzzling over what thread color to use for quilting. How do you decide what color thread to use? As a long arm quilter, you must handle quilts made by a bunch of different people. Is it ever difficult to send them back once you’re done with the quilting? You can read more about Angela on her blog, Quilting is My Therapy. Her book, Free Motion Quilting With Angela Walters, will be out this June. Gabrien Chaney used the Plain Spoken pattern from Weeks Ringle and Bill Kerr’s The Modern Quilt Workshop to make this beautiful quilt for her daughter’s bed. “I chose to sew Plain Spoken quilts for each of my children after they received new bedding sets for Christmas one year. I wanted to make quilts that would coordinate with those sets but also still be usable with a totally different style of decor as well. I basically wanted to make quilts that could be used for many years and not look like they were made for babies. I saw a Plain Spoken quilt on Flickr and decided it would be the perfect pattern. I made my son’s first. When I finished the top my mom offered to long-arm quilt it because she had just taken a course at our local quilt shop, Sharon’s Attic in Hillsboro, Oregon. To prep the quilt I thought I only needed to allow the 4 inches of batting and backing all around the quilt-to hold it in the frame. As it turns out, there was more I should have done. On quilting day Mom had to struggle to get it ready because I hadn’t nested my seams or clipped threads, or properly lint rolled it before bringing it in. I also hadn’t thought about how much stretch the quilt will experience on the frame- it was a problem that I hadn’t back-tacked each seam. I chain pieced the top and the would have been best to have set my machine to the automatic back-tack setting. Despite these struggles, Mom did a great job and the quilt is loved. About a year later I finally got my second Plain Spoken quilt top done. I decided to have it quilted on the long- arm as well because my daughter wanted a spiral design similar to another quilt we had seen recently. I didn’t think I could manage a spiral on my little machine. We asked Wanda Schwab, a quilter- friend of my mom’s, who rents the machine at Sharon’s Attic. We knew she could do the spiral with a template. We thought a spiral would offset the rectangles nicely. I also wanted a large design as opposed to tight, because the quilt is backed with flannel and I like the feel of loosely quilted flannel. 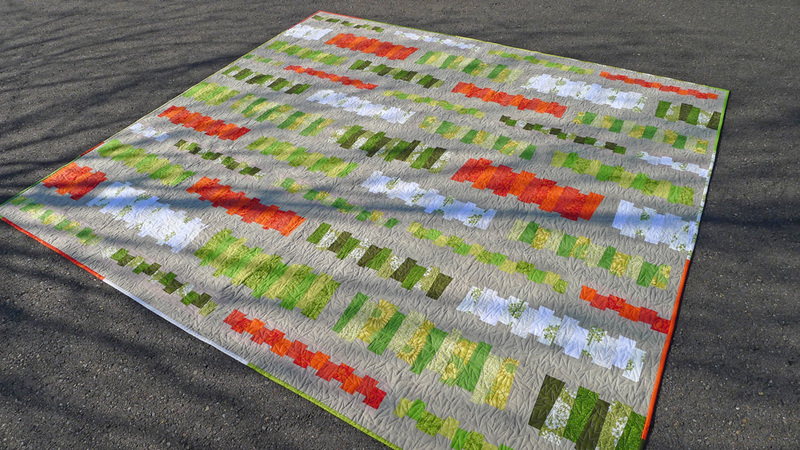 Today’s featured quilt is Leesa of Square One Studio’s String Quilt for Carol Lee. “This quilt was years in the making—eleven, to be exact. In 2001 I received some amazing vintage fabric from my painter-friend Carol Lee whose quilt-making mother had recently passed. As a junior professor working towards tenure, I had limited free time, I barely managed to keep up with crib quilts for the babies other friends were welcoming in to the world. With tenure behind me in 2010, I wrote to Carol Lee (also recently tenured, huzzah!) about her color preferences for a quilt incorporating her mother’s scraps. She preferred a palette that avoided primaries and incorporated “maybe something to complement a gray chair”? So I thought about the kind of design I wanted to tackle, about the vintage integrity of the scraps, about Carol Lee’s own abstract paintings, and about the unfortunate fact that the important milestones in a single woman’s life too often pass unrecognized even now, in the 21st century. After a few spectacularly failed attempts, I hit upon this patch-y vertical string quilt design in pink, olive green, grey and golden yellow—a palette I imagined might have been a “groovy” Pantone color chart from the late 60s/early 70s. The top came together slowly and was finished a full decade after I received the scraps. It was my second machine-quilted project ever and the first on my new Janome Memory Craft 6600 “space age” model. 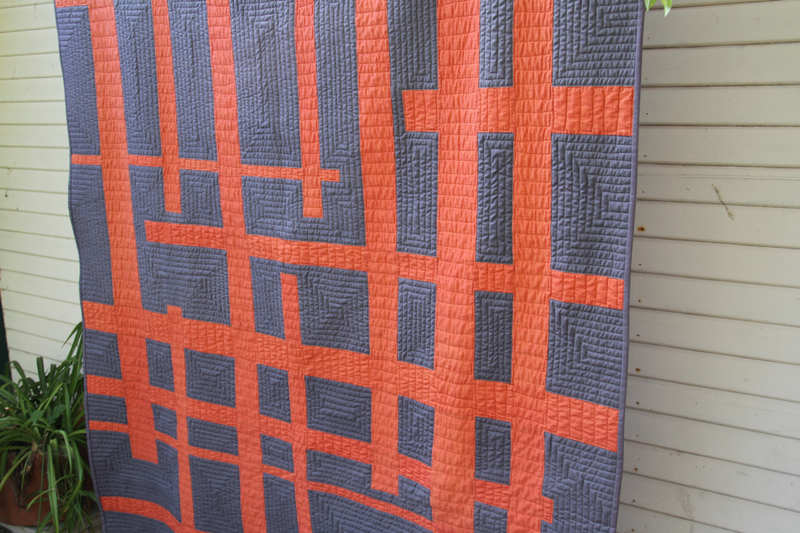 It was also my first attempt at quilting a measured, tightly spaced grid over an irregular, “wonky” design. This is not to suggest that I marked and measured a grid before quilting, I don’t have the patience for that. 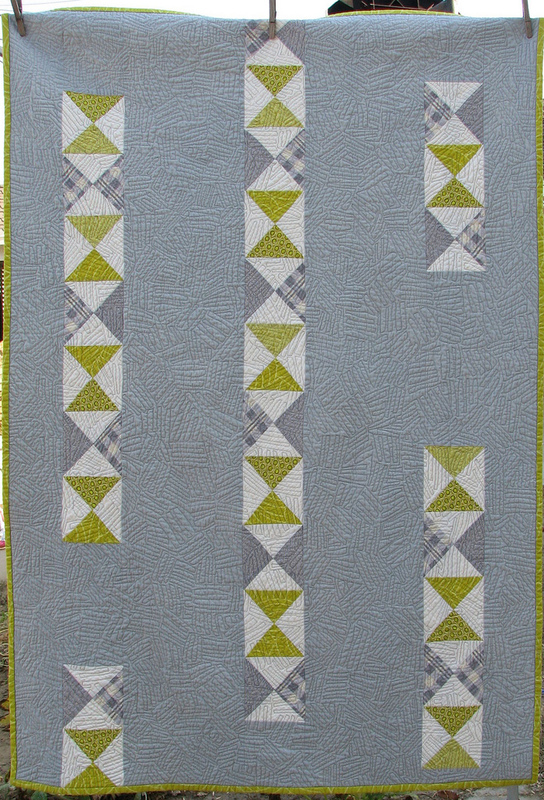 I marked a giant “X” through the middle, positioned the adjustable quilting guide to 1” and sewed outward from the middle using the original X as a reference. Although it can be risky to work with unwashed fabrics and tedious to sew a closely-knit grid when you’re anxious to see the finished result, I feel the resulting crinkled, vintage texture is well worth the effort. It’s easy to get caught up in the excitement of a finished top but equally important to execute the quilting in a way that will complement and enhance the design rather than detract from it. 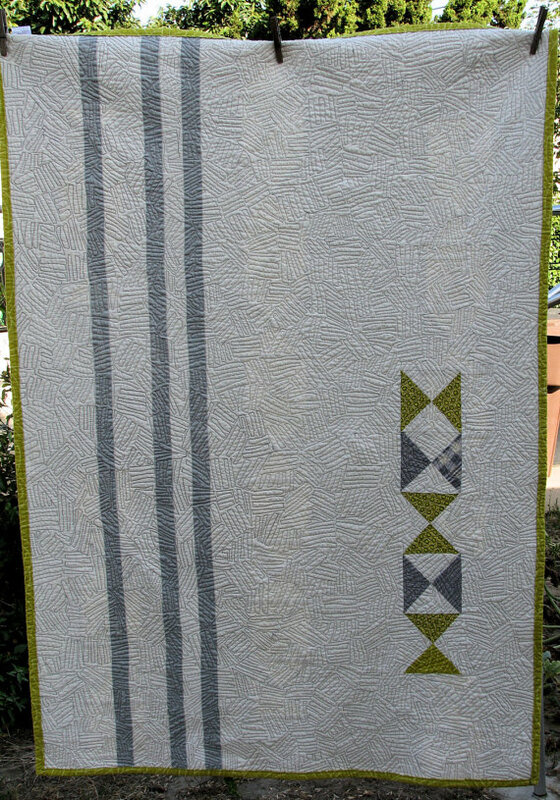 Alison used hand quilting to add diamond-shaped accents to this quilt made with scraps leftover from two previous projects. 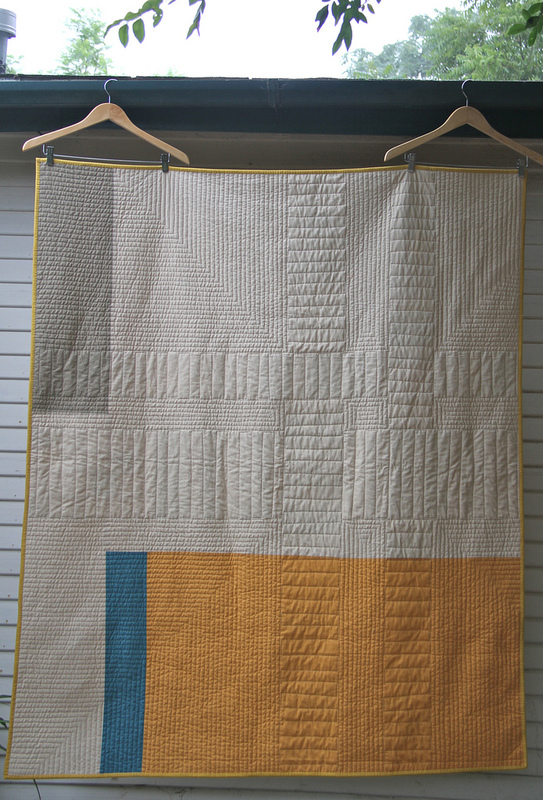 “The quilt came about because I was having a bit of a Tufted Tweets (Laurie Wisbrun) obsession. I’d already made two other quilts with the Tufted Tweets line and was left with a bunch of scraps which I wanted to make in to one final quilt. I also have this thing about objects having to be the right way up so was looking for a block that wouldn’t turn the Tufted Tweets chairs upside down. Quilters Cache is a great free online resource with literally hundreds of blocks to choose from. So I started trawling through the pages until I stumbled on this one and could immediately see the possibilities. It’s paper-pieced and I did it the old-fashioned way of printing off one copy and then tracing new copies from a light box that was going for a song on Ebay. Because the Tufted Tweets fabrics are so vibrant, I knew I wanted to tone them down with a couple of neutrals and that really is how the top came about. It is hand-quilted for a couple of reasons. I always have to have something on the go downstairs. My sewing room is on the ‘flop toor’ which is the unintentional spoonersim our youngest daughter used when asked where Mummy was and ‘flop toor’ it has stayed! To hide away there in the evenings would be anti-social so when I am downstairs in the evening, I can’t just sit and talk or watch TV…I still have to be doing something else and hand-quilting is that something else. The other reason I hand-quilt is I find it a de-stresser. I find the whole hand-quilting experience very calming and soothing. 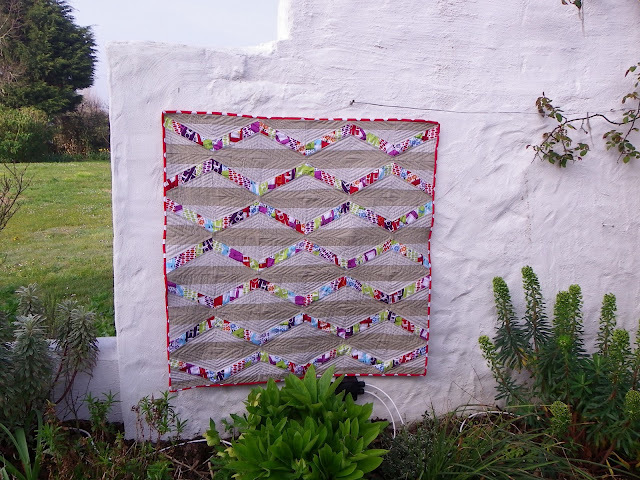 I’m sure if hand-quilting was included in prison rehabilitation schemes there would be a whole lot less reoffending! I quilt because there are no boundaries. I used to knit but you basically start out with a pattern and you pretty much have to follow it if the end product is going to turn out anywhere near successful. Quilting, especially modern quilting, is liberating. There can be a pattern if you want there to be but equally there can just be that seed of an idea in your head that grows and develops as you progress. There is no one right way. It might not turn out how you first thought it would but it will turn out as a quilt none-the-less that is an individual expression of you. 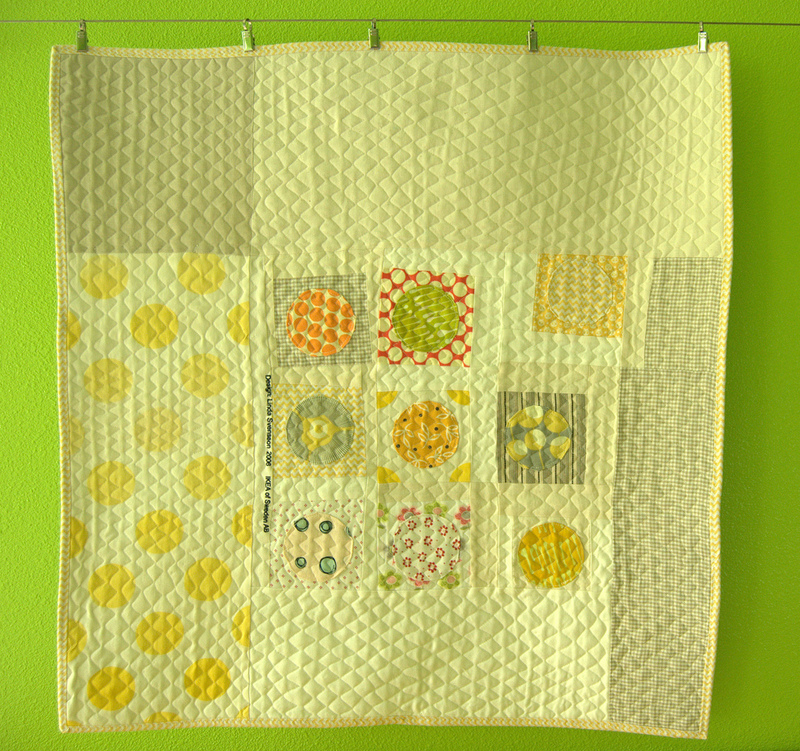 You can read more about Alison’s work on her blog, Little Island Quilting. 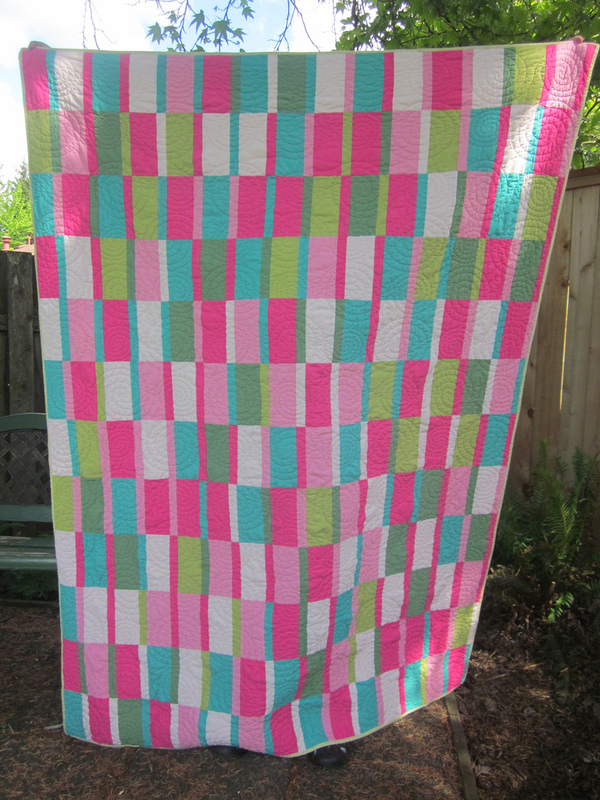 Chantelle Brightbill used a lovely free-motion quilting pattern to enhance her 37” x 52” Broken Chain quilt. “I hesitate to make designs with a lot of triangles or ones with many blocks repeated, but I love using traditional designs, so I decided to use the Yankee Puzzle block in a way that was less stressful, by just piecing it into a chain. I decided that having the chain ‘broken’ made for a more interesting composition. For the solid color I originally intended to use white, but it felt too bland when I laid it out, so I hand dyed it grey. I specifically didn’t want to use the exact same tone as the grey prints, so I added a bit of yellow to the dye and gave it a greenish undertone. I think that small contrast adds a lot to the limited color palette. I began free motion quilting because I am not very good at stitch in the ditch (I always wobble out of it), and I don’t have the patience to lay out a formal design. 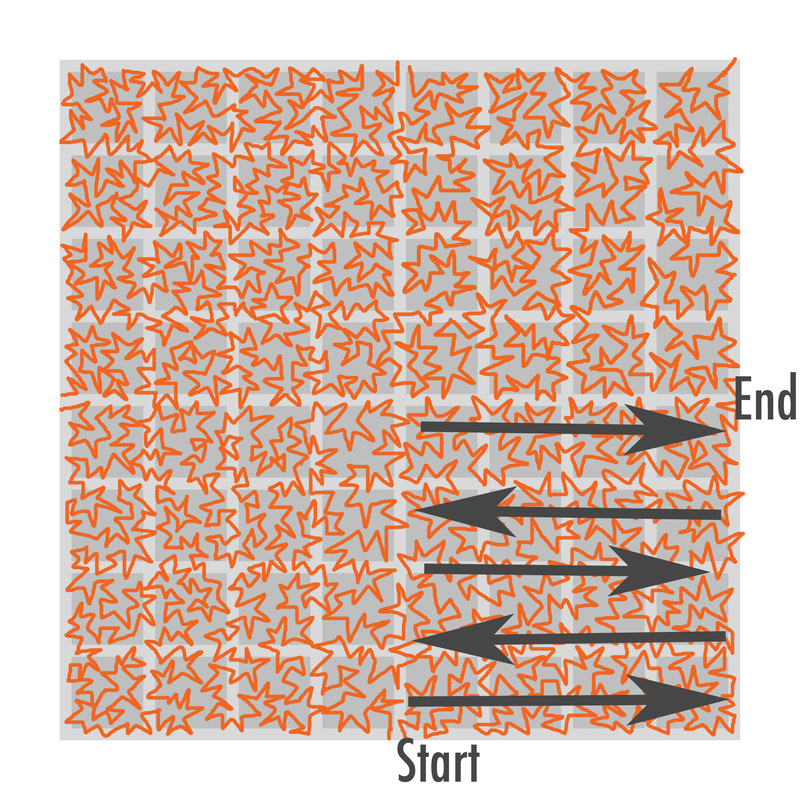 I was basically just doing stipple for a long time, but I started noticing more creative types of free motion in magazines and blogs, so I started experimenting. Now quilting is my favorite part of the entire process, in fact for a long time I only made whole cloth quilts. I don’t enjoy lots of complicated and exacting piecing, I just want to create a foundation to quilt on. I do all my quilting on my own machine, which has a few extra inches under the arm. That makes a big difference in what it can handle. I can quilt King size quilts on it. I usually do not decide what kind of quilting pattern I am going to do until the quilt top is finished. Basting gives me a chance to spend some time with the design, and by the time I have finished pinning the top has told me how it wants to be quilted. Chantelle taught herself to sew when she was 16. Growing up in a cotton farming area of rural Australia has given her a strong commitment to using organic cotton fabrics. She is a member of the Orange County, California, Modern Quilt Guild. 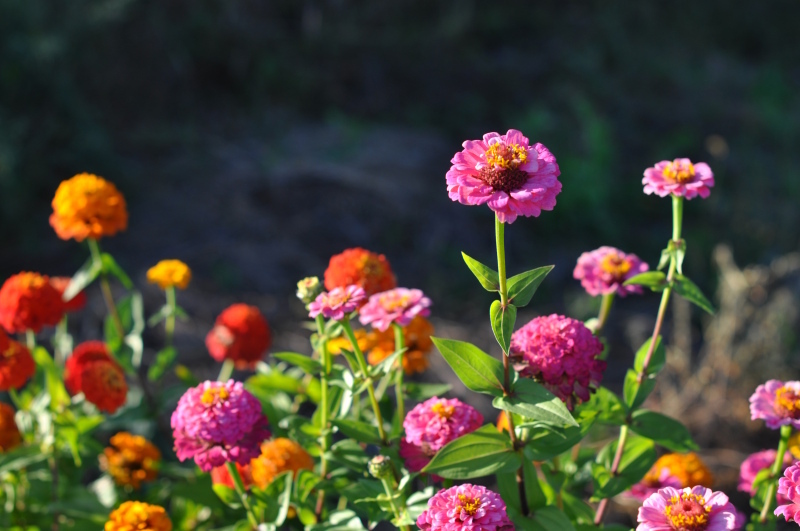 Lynn Harris’ Zinnias quilt was inspired by a photo (shown below) of zinnias growing in her garden. 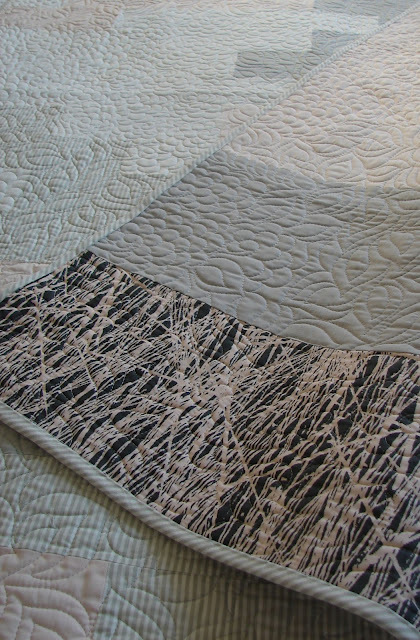 She used a walking foot to quilt a beautiful texture of wavy lines across her quilt. 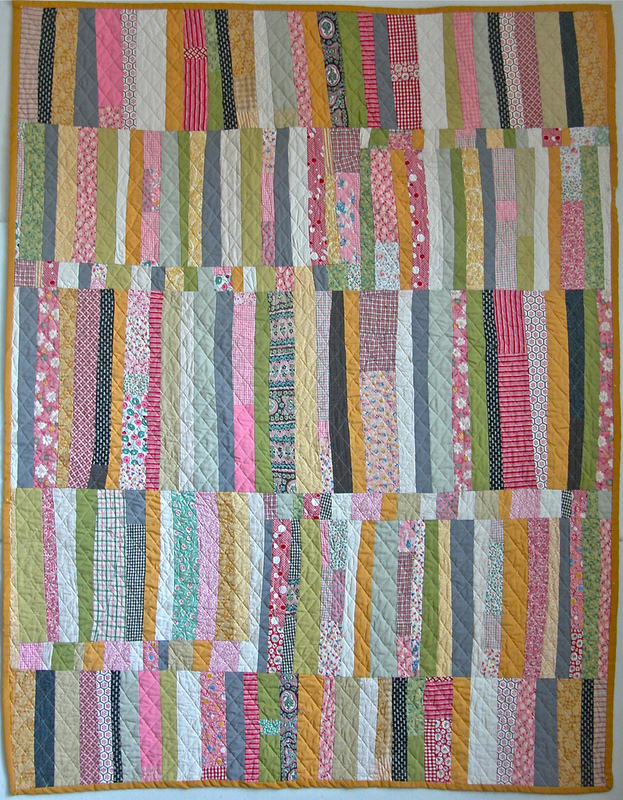 Lynn finished her first quilt in 1976, when she was in middle school. Today she’s a member of both the Ann Arbor and Brighton, Michigan, Modern Quilt Guilds. You can see more of Lynn’s work on her blog, The Little Red Hen. Quilting is what separates quilts from blankets. 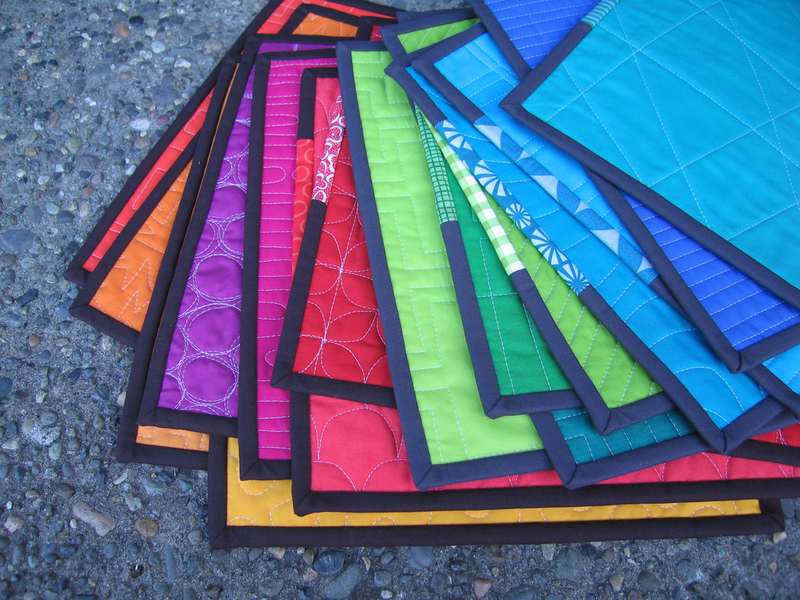 It holds all the layers together and provides a great opportunity to add texture to our finished quilts. 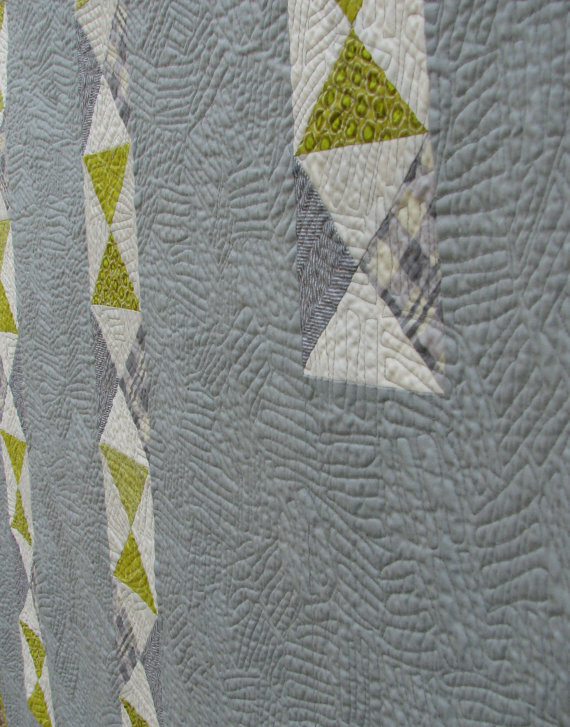 During this last week of 100 Days of Modern Quilting, we’ll be looking at quilts with particularly interesting quilting including: straight line walking foot quilting, free motion quilting, hand quilting, and longarm quilting. Welcome to the week of quilting!